Ayurveda, the system of life, is an eternal system that has already integrated eight limbs of healing within itself, from herbs to surgery to psychology. 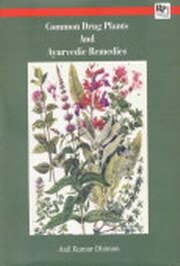 This book, Common Drug Plants and Ayurvedic Remedies aims to provide a bird's eye view on common drug plants met within Indian subcontinent. The book is divided into three parts, the first part is introductory, second part contains information about common plants of the country and the third part deals with the ayurvedic remedies for common ailments. The first part starts with the introduction followed by the history of Indian medicine system ie; ayurveda, energetics and therapeutics of herbs and various types of herbal preperations, etc. are given. In the second part, the plants are arranged with their common names, followed by their Latin names and families. The main identification characters of the plants are given besides the parts used and medicinal uses. The third part of the book gives a list of various recipes for common ailments for the general users. Though utmost care has been taken in providing the remedies for common ailments, yet the readers are advised to consult the doctors in case of serious illness.